Learn how to switch back to any version of your script. StudioBinder makes it simple to swap back and forth between different versions of a script. For example, you want to go back to previous version of a shooting schedule to see if it flows better than the new version. This is useful when you need to compare the two versions quickly. From the Stripboard page, click Version History . Select a different script, then click Make Current to swap to a previous version of the shooting schedule. Note: After swapping to a previous version, a confirmation notification will appear. Will all my previous information be retained? Yes, all of your work from your previous versions are still available to access anytime. Can I merge multiple Versions? No, however StudioBinder makes it easy to sync shooting schedules when you upload a new version of your script. Can I import multiple scripts into a single Project? The Free plan only allows your to import one version of your screenplay to test-drive. If you upgrade to a premium plan, you'll be able to upload multiple Versions of your script which you can easily swap between. Can I duplicate my shooting schedule (stripboard) to create variations? Are you looking to save different versions (multiple schedules) of a shooting schedule? For example, if you want to create a 2nd shooting schedule and changing the scene ordering. Currently, there isn't a way to duplicate a "Version", however, the best approach would be to import the same screenplay (without selecting Sync Screenplay being selected). That way, you can easily roll between different Versions of your stripboard. 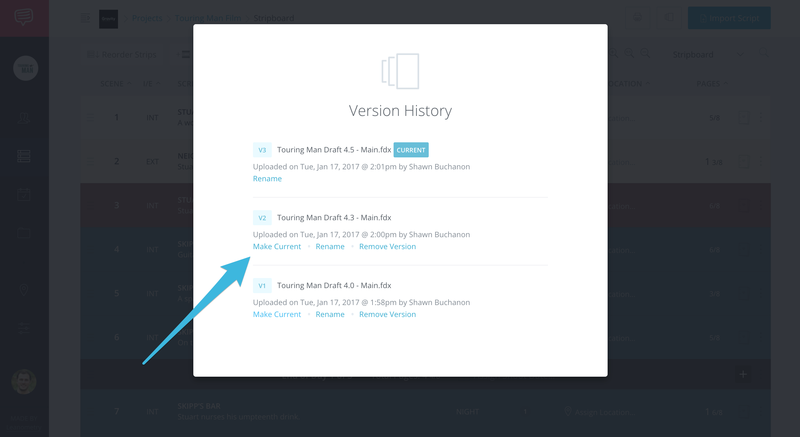 Keep in mind that you will also have a new version of your Breakdowns created, so it's suggested that you take care of the schedule before tagging elements, etc. Remember to always double check what version you are working on to avoid duplicating work unnecessarily. Note: StudioBinder automatically labels each script you import with the time, date, and version number.